if you’ve been around here for a bit, you know that i like to celebrate with cake. see some of my faves here: thai tea vietnamese coffee cake, matcha cake with strawberry swiss meringue buttercream, caramelized nectarine cake, banana cake with banana nutella swirl buttercream. so what are we celebrating? someone’s 21st is this week! it won’t be a night of drunken revelry, since 1) i have class all day, 2) not a huge fan of alcohol (tbh would rather just have tea or juice or something; this also doesn’t apply to kahlua or amaretto, which are delicious in baked goods) and 3) i’d rather have sugar. plus, there’s a sneaking suspicion that on the spectrum of asian glow-up, i lean more towards my mom’s a sip (kidding, but only a little) and done side. and in general, i’m not a go big or go home kind of person for my birthday, as evidenced by my unsure plans (which might shape up to be dinner out and/or baking at my apartment). 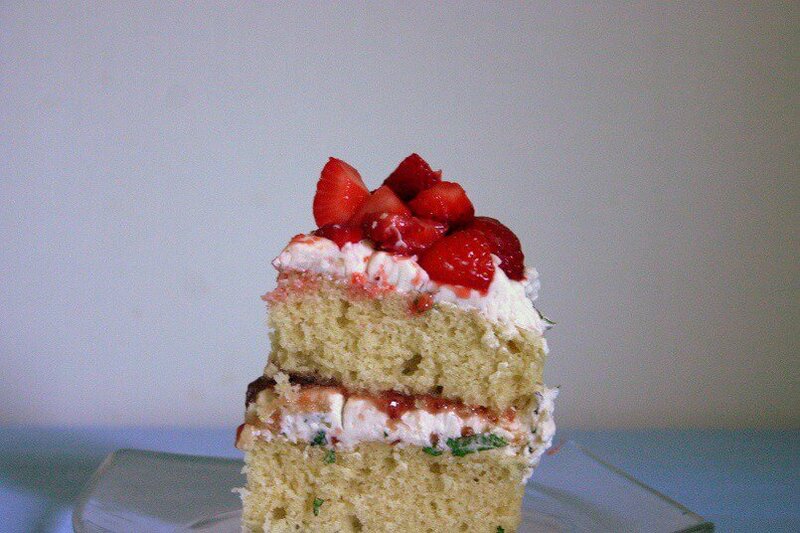 anyways: strawberry lemonade cake with fresh mint buttercream. i won’t be having this particular cake on my birthday, though you can rest easy at night (because i know you were extremely considered) knowing that i will be having some sort of sugar on that day. it was inspired by my bias against plain water, since it’s boring (i still don’t understand how the raindrop cakes blew up, at least from a taste perspective). drinking flavored water makes it much more interesting, and i’ve taken my favorite things (strawberries, lemon, mint) to put in water and turned that combo into a cake. the cake itself is a tightly crumbed, gently lemon scented number. 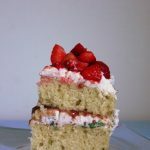 it’s delicious for sure, and goes well with the slightly herbaceous, refreshingly minty buttercream, but the real stars are the strawberries. this isn’t the place for sad (oof, random tangent, but have you seen logan? that was an almost constant stream of unnecessary violence and depression, and my friend started laughing when she heard me sniffling) strawberries that you want to get rid of; wait for those summery crimson berries. macerating them helps bring out more sweet juiciness, and there’s a smear of strawberry jam to add a touch more flavor, but starting with berries you’d want to eat straight up helps a lot. if you are making cake ahead of time, then i recommend clothing it in buttercream or ganache or something. if it’s naked like this, the cake dries out super quickly. if you are THAT into naked cakes and have to make it ahead of time, covering the exposed cake with wax paper is the way to go. 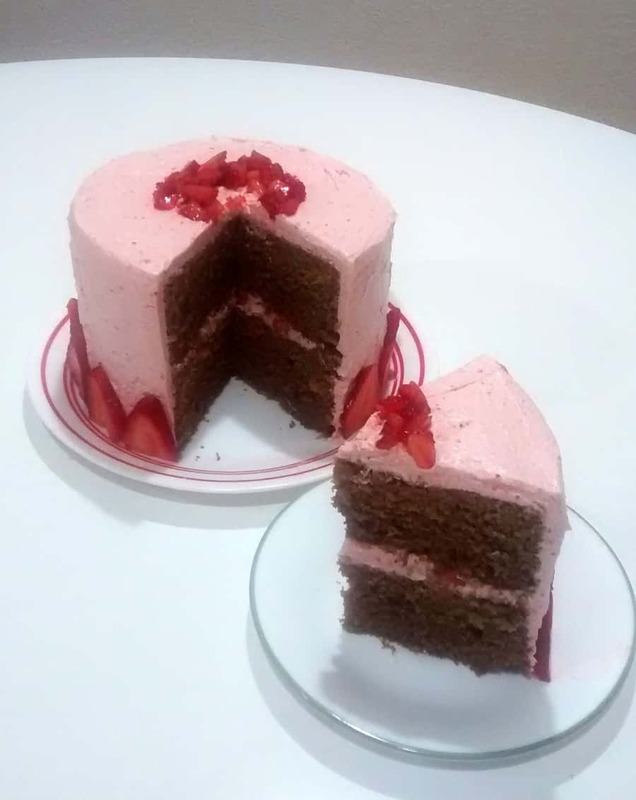 i tear a piece off and press it against the cake, using the buttercream to secure it. easy peasy! i also like storing leftover cake this way (in the fridge, please; i had some questionable broccoli last week and was happy that my body didn’t flinch, but why push it?). 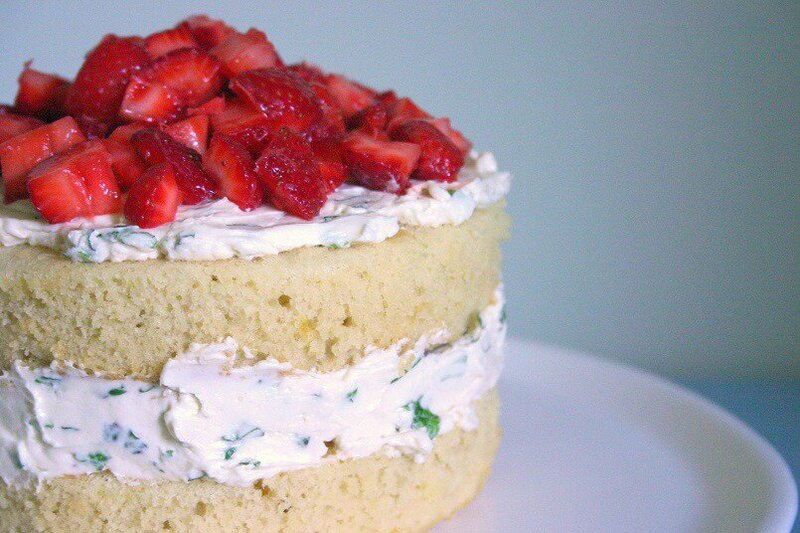 This strawberry lemonade cake with fresh mint buttercream is summery and fresh. In a bowl, mix the dry ingredients. In a cup, mix the milk and vanilla. Beat the butter until light and creamy. Add the sugar and beat until fluffy. Beat in the eggs, one at a time. Beat in the dry ingredients in 3 batches, alternating with the milk mixture. Fold in the lemon zest. Scrape the batter into two greased and lined 6” round cake pans. Bake at 350F for 20-25 minutes, until springy. Cool for 15 minutes, then run a knife around the edges and invert onto a rack. Peel off the paper, turn the cakes upright and cool completely. In a heatproof bowl set over a pan of simmering water, combine the egg whites and sugar. Cook, whisking constantly, until sugar has dissolved and mixture is warm to the touch. Attach the bowl to the mixer fitted with the whisk attachment. Beat until it holds stiff (but not dry) peaks, and is fluffy and cooled. Switch to the paddle attachment. Add butter 1 T at a time, beating well after each addition. Beat in vanilla. Fold in the mint until combined. Mix the strawberries, lemon zest, sugar and a pinch of salt. Let macerate for at least 30 minutes, or until the berries become juicy. Level the tops of the cakes with a serrated knife. Place a dab of buttercream in the center of a cake stand/serving plate, then place one cake layer over the buttercream and press it down to help the cake stick to the buttercream and the plate. 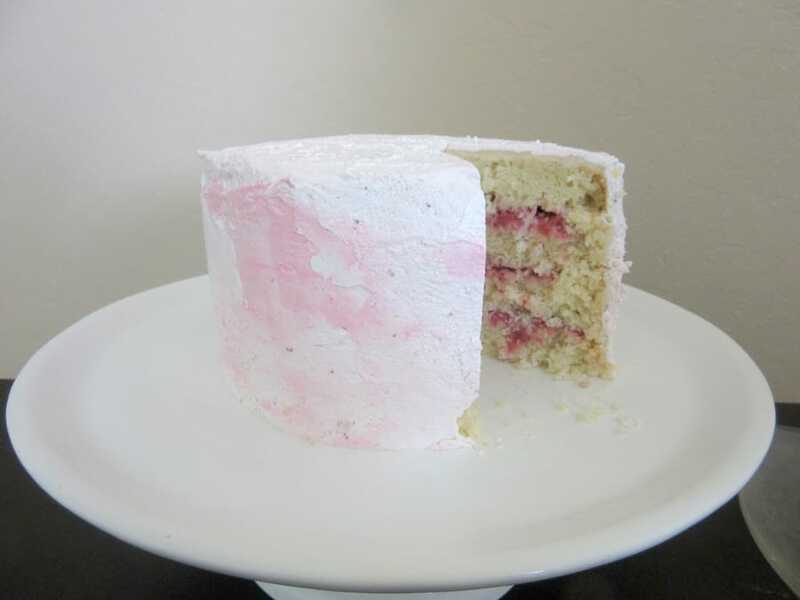 Spread a thin layer of preserves on the cake; this helps keep the cake moist while adding a bit of flavor. Spread on 2/3 of the buttercream. Add the other layer, bottom up so that you have a flat top. Press down slightly to get rid of some of the gaps in between the layers (if you still have gaps, you can spackle on some buttercream in the cracks). 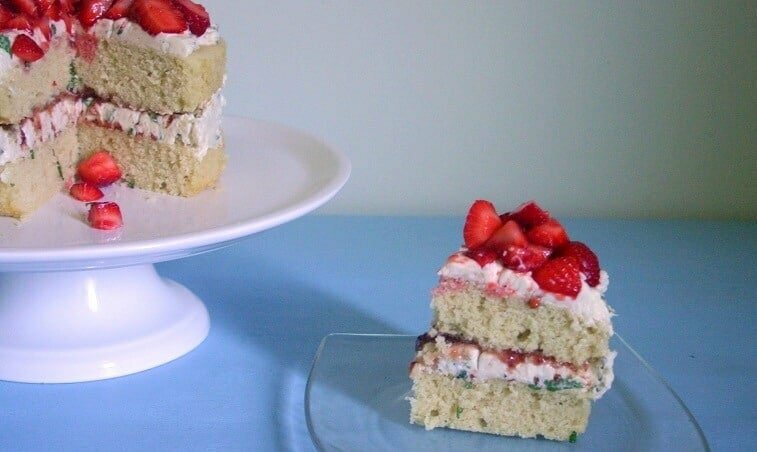 Add the rest of the buttercream to the top of the cake, then pile on the macerated strawberries. Decorate with more berries and mint. If you want a normal sized cake, double everything (cake, frosting, filling, etc). Bake the cakes in two 9” round cake pans for about 35 minutes. thanks! i’m waiting for summer berries (well, i’m waiting to go home so my mom can buy me summer berries 😉), but this would be such a good way to use some strawberries after you get tired of eating them plain. This is such a pretty cake, Heather! Fresh mint buttercream sounds like a dream :). Happy birthday! I hope it’s one to remember! fresh mint buttercream is a dream! and now i have “once upon a dream” from sleeping beauty stuck in my head, and am imagining her waltzing through the forest with a bowl of buttercream. Happy Birthday Heather! I love how simply but deliciously flavored this cake is. I’m big into citrus in my sweets and definitely a fruit fanatic as well. This is perfect! A lovely cake and it sounds fantastic! Strawberrry…Lemonade….Mint! Perfect for spring! And Happiest of Birthdays to you! This is beautiful! I love little cakes, I’m not a fan of eating cakes as I prefer ice cream, but they are fun to look at! I’m not a drinker either! Always found it sour and just not enjoyable! Yummy! What a delicious treat, Heather! OMG THIS IS GENIUS and PERFECT for the upcoming warmer months… Eating strawberry lemonade… Drinking Strawberry Lemonade – YEAHHH I WOULD EAT IT!! mmmmmmm. it’s a little less refreshing than ice cold strawberry lemonade, but the flavors are just as tasty! Fresh mint buttercream sounds so creamy and dreamy. I would be a happy camper licking straight out of the bowl 🙂 Happy Birthday girl, have a blessed one!!! oooh same. swiss meringue buttercream is always so tasty, even plain! one time i had a ton leftover, and ended up spreading it on bagels (healthy breakfast, i tell you!). Wait Wait Wait Wait Wait!! Seriously hold the phones this looks so good I want to jump through the screen and devour it. I love fresh fruit on cakes, and I have a serious affinity for lemon cake, but this fresh mint buttercream takes me over the top. Happy Birthday My Friend! Enjoy every second of it. fresh fruit on cakes is so good! oh and have you had the meyer lemon cupcakes from kara’s (there’s locations in sf and the south bay)? that’s my favorite lemon cake ever, hands down. definitely had to look up what full cream milk was 😂 but yes, full cream/whole milk is the way to go! though i realized recently that whole milk in the us is about 3% fat, which isn’t that much more than the usual 2% i keep in the fridge. so is there a huge difference between whole and 2%? i dunno. Happy Birthday, Heather!! This cake looks like a beautiful way to celebrate! I’m a fan of celebrating with cake too. Yum! 🙂 I love all the fresh ingredients you used in this dessert, especially the fresh mint leaves. And those fresh strawberries– gorgeous! Enjoy your celebration! It’s looks so refreshing, this cake!! Bet I would like it a lot – maybe a bit too much ahah!! it’s rich (i mean buttercream…) but definitely fresh in flavor (: i definitely liked it too much (and had to get it out of my house asap). Happy Birthday Heather (ahem.. belated) What is more gratifying than making your own birthday cake with all your fav flavor combos!! 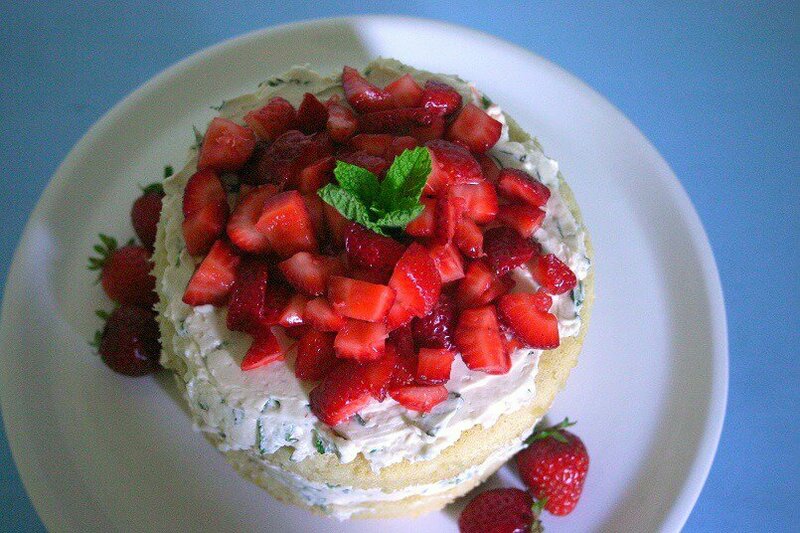 Lemon and mint is a match made in heaven and I am sure strawberries work very will with it. mint buttercream is so tasty! especially when it’s fresh mint; i love peppermint extract, which is refreshing in a cooling way, but fresh mint is herby and bracing in a whole other way. What an elegant spring cake. I adore it! thanks! elegant and spring make this sound like it’d be perfect for tea time (why isn’t tea time a thing in america?!). I love to have a good cake, whether it my birthday or not, and this one looks so delicious Heather. I’m not the biggest fan of lemon but if it’s used as a zest like it is here then it’s a win for me! i’m down for cake whether or not it’s my birthday too (; this one has a hint of lemon, but the strawberry and mint shine more here!